Again, if you fit one in like I did above with Panarin, sure, but realistically, it probably takes two to fix the third line without touching the top six. Stone, Eakin, and Simmonds? We can live with that. Hayes, Eakin, and Ferland? Yep, that’ll do. But without getting multiple players, the complementary pieces the Golden Knights have will make it difficult for Gallant to create a balanced, dangerous, complete line. When you consider how long it takes new players to assimilate to the VGK system and the fact that the sheer number of options paired with the limited number of games before they really count, it’s an incredibly tall task. So it brings me back to the original question, how much should McPhee be willing to give up to bring in third line help? Before we even consider what the price would be for a high-end scorer that could help, we have to go in with the understanding that a radical change in the makeup of the lineup will be necessary to make anyone fit. Now, I’m not going to sit here and argue what’s the right or wrong thing to do, because making a move might be at this point. There are some underlying issues with this team (record against good opponents, even strength goals, power play efficiency, road struggles) that indicate they may not be good enough as currently constructed to repeat as Western Conference Champions. And, without adding a scorer, there’s probably no way to make the third line go with the current pieces, and that’s even if you are willing to break up the top six. But, health has been an issue for most of the year, and as the team has started to return to what it is supposed to be, they look a lot better, and an added layer of consistency can be expected. There’s also the Erik Haula mystery which the organization has a much clearer picture on than we do. With Haula back in the fold the options look much more plentiful. McPhee has 14 days and six games to evaluate his team and make a very difficult decision. 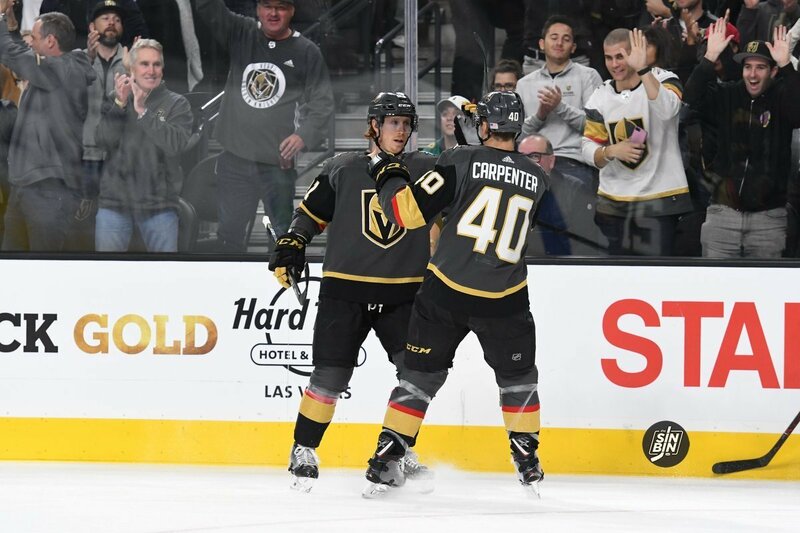 Do the Golden Knights have enough scoring to get the job done against the NHL’s elites and if they don’t is he willing to give up assets and make a major change to his lineup with just over a month left in the season, throwing caution to the wind, to try and fix it? It’s an interesting dilemma, and one I for one am glad I don’t have to make the decision on what to do. My job is much easier, to criticize when the wrong choice is made. Just keep it in mind over the next two weeks as you watch games and read trade rumors. Adding a piece means a lot more than just adding a piece. They don’t have enough depth to make a trade worthwhile , without giving up organization structure/foundation. They already are into four picks and first rounder for #67. That is five potential slots in their organization GONE for one player! How much more of their future would they want to leverage at this point in time? Their minor leaguers are not good enough in Macek, Perri, and Carr. Unless they want to lose more organization depth or bring up some of their youth, it is highly unlikely that they will be dealing. They have a lack of depth in the 23 to 25 age range. I don’t see them trading the younger players unless they get a really good player that would be able to give them at least 5 years of good hockey. And those types of players come at a high cost to organization depth. A more in depth analysis about HOW they would be able get some of the players mentioned in the article might be worth following up on. Then there is the question of chemistry, it takes awhile for new player(s) to find their groove most of the time on a new team. You can sign guys all day to fill those “five organizational slots.” Does any team claim more waiver guys than Vegas? Honestly, not an issue. Changing any of the top six gives me the opposite of a tickle… We’ve seen every player in that mosh pit of a third line go on a nice little streak at some point. I see Gallant just changing it up until one gets hot and then roll with it till it needs changing again. If we struggle in the playoffs it’s not going to be because the third line didn’t score, it will be because we burned out our goalie in the regular season. It depends, I used to live in Ottawa and I know that Stone is easy to get along with and will likely sign with Ottawa if they offer him the money and term he wants. Trouble is since the Ryan deal Ottawa is lowballing their players so I doubt he will resign with them. I do think unlike Panarin he would sign an extension before July 1st with a team he is traded for as long as he gets what he thinks he is worth. If McPhee can get his commitment, I say we include either Miller or Theodore and either one of our 2nd (next year) or 3rd (this year) pick. From what I am hearing this is more than what other teams are offering. Sit this one out GMGM… This is a year to be content with being an “also-ran” and pushing as far as you can get with what you have now. We have 3 – 5 years of better hockey from the core of this team ahead of us. Don’t leverage the future for another few playoff games. Don’t get me wrong, if we can pull one of these guys in with an extension as part of the deal, I’m open to that. But we’re not if a “pure rental” situation this year. There are decades of good hockey to be had here. I’d rather be a consistent playoff contender than a once every 5 years make a run. Panarin on our 3rd line … haha. Stone and Simmonds together on the third line…. haha. Marchy, a guy who outscores Panarin, has term, Panarin rental. Please…but tell me how they will need to add multiple high picks and their third best defender too. I love me some Marchy, but you’re wrong. Panarin is only a rental if you don’t resign him, which you could do if you jettison some salary. VGKs have good depth, but no player in the top 80 scorers in the league. Which Panarin is #17 btw. Unless we have a hidden Russian community here that I am unaware of he won’t sign with us. Both him and Bob said they will both wait til July 1st and Russian lifestyle is a must. Both him and Bob will sign with the Panthers in the off season.